ESLP has had the honor of hosting some brilliant speakers in the past years and we'd like to share with you more about them. mark! Lopez comes from a family with a long history of activism. He was raised in the Madres del Este de Los Angeles Santa Isabel (Mothers of East LA Santa Isabel – MELASI), an organization co-founded by his grandparents, Juana Beatriz Gutierrez and Ricardo Gutierrez. This set his trajectory as a community activist. He has engaged in a wide array of student activism at UC Santa Cruz where he earned his B.A. in Environmental Studies, and taught university courses at UC Santa Cruz, Cal State Northridge, and UCLA Extension. mark! earned his M.A. from the Chicanx Studies Department at Cal State Northridge, where he completed his Masters thesis titled The Fire: Decolonizing “Environmental Justice.” mark! joined East Yard Communities for Environmental Justice as a member three years before joining the staff. After serving as Lead Organizer for East Yard Communities and Co-Director with EYCEJ Co-Founder Angelo Logan, mark! accepted the Executive Director responsibility. He organizes in the area where he was born, raised and continues to live. Max Jimenez was born in Philippines and moved to Highland Park in Northeast Los Angeles when they were 8 years old. In LA, they worked with the Alliance for Climate Education in hopes to bridge and engage community members in organizing around environmental racism and institutional neglect that families of color and low-income folks struggle with. Max’s work is focused on basic needs such as food and housing insecurity. They live a plant-based lifestyle and strive to encourage others that eating real and healthy food should be accessible and affordable to all. The gentrification happening in their community is causing displacement and houselessness, which shifted their focus on housing justice. Max is now a third-year as Community Studies and Politics double-major at UCSC. They are the Student Union Assembly President and they have been working tirelessly to make sure that students are living in habitable and just housing conditions. 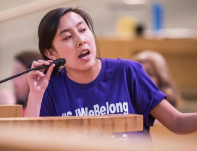 They, along with other students, established a new organization on campus, the Student Union housing Working Group, where they have campaigns and projects that revolutionize the housing movement in UCSC, the City of Santa Cruz, and even on a UC Level. Francisco Ferreyra is a Community and Regional Development undergraduate at UC Davis, and a recent transfer from Oxnard, CA. After representing California Community College students through legislative advocacy for two years, they began organizing against the encroachments of multi-billion dollar oil and gas companies including NRG and the forces behind DAPL. Today they help lead the Fossil Free UC movement and serve as Environmental Sustainability Officer for the UC Student Association. Ferreyra spoke about Resistance in the Age of Climate Armageddon: Non-Compliance or Non-Existence. He gives first-hand accounts of strength and sacrifice from Standing Rock that show us the 500 year old context of dominant forces that have plunged our species into a full on climate crisis. Vegan Voices of Color’s mission is to spread awareness on the connections of oppression that connect animal agriculture and People of Color. From health epidemics to environmental racism the links between our communities and those of non-human animals cannot be ignored. The plight of billions of sentient beings is integrally connected to our own. Unfortunately mainstream veganism is severely disconnected from most PoC as we see very few of our own faces reflected in the movement. This white veganism is also too often non-intersectional. They see that issues ranging from income inequality to food access are ignored, problematic connections of racism to speciesism runs rampant without enough critical thought put into these comparisons. Tired of seeing how this problematic veganism turn so many people away we strive to provide a space to link culture, race, income, and ethics together under the solidarity of social justice. Chris Lepe and Fahad Qurashi in "Mobility movements - Student and community engagement to advance affordable, accessible, and sustainable transportation options"
Chris Lepe is the Silicon Valley Senior Community Planner for TransForm. TransForm is a Bay Area-based non-profit organization that promoting walkable communities with excellent transportation choices to connect people of all incomes to opportunity, keep California affordable and help solve our climate crisis. Chris engages community leaders, elected officials, transit riders, and the broader community in transportation, land use, and housing plans, projects, and policies in order to advance social justice, environmental protection, and community health. He received his BA in Environmental Studies with a minor in Latin American/Latino Studies from the University of California at Santa Cruz (UCSC) and his Masters in Urban Planning at San Jose State University (SJSU). Fahad Qurashi: Bay Area Directo - Fahad has worked at YLI for over 11 years transitioning from a program participant in San Francisco, working up the ranks to his current position as Bay Area Director of Program. He is a diplomatic and tenacious leader with deep content knowledge and practical public policy experience in the areas of public health, land use/ zoning, housing rights, health equity, legal rights for immigrant youth, violence prevention, sexual health education, and youth development. Ryan Camero is arts activist and community organizer whose work focuses on visual storytelling, cross-cultural understanding, and inter-generational communication in achieving social justice. 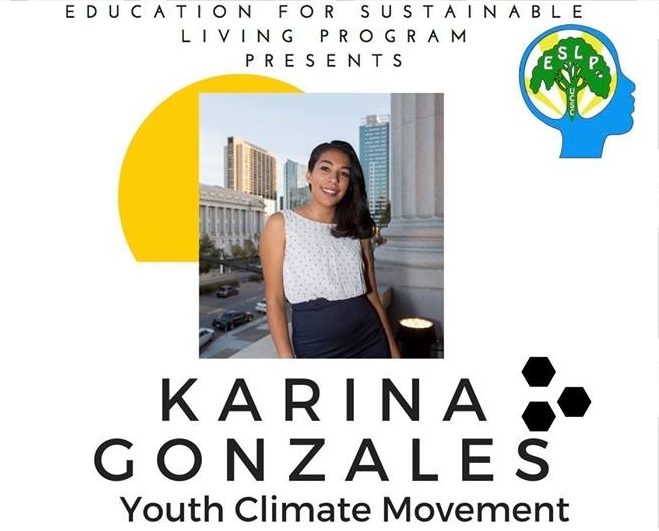 Karina organizes around social justice, racial justice, and climate issues. She believes that these topics are all interconnected and aims to weave these major issues into a coherent narrative that will move us toward a more sustainable and equitable future. This year she is co-leading a youth delegation to the 2017 Climate Negotiations.